To say that I was excited to work with pork this week is an understatement. I agonized over finding just the right recipe to showcase my favorite protein (well next to eggs, that is). At first I was thinking of doing some sort of roast but I wasn’t feeling inspired by the idea – I mean it’s winter – it’s cold and snowy, I needed a hearty Sunday dinner. And then, as if right on queue I received an email from Tasting Table with a pork meatball recipe from chef Michael White of Osteria Morini in New York. I read through it and immediately knew that this is what I’d be cooking up. I made a couple changes to the recipe, thought about a good tomato sauce to complement it, invited the fam over and went shopping. To start, combine the bread and milk in a small bowl. Discard the excess milk that remains after the 10 min soak and then break the bread up into about 1/4 inch sized pieces. 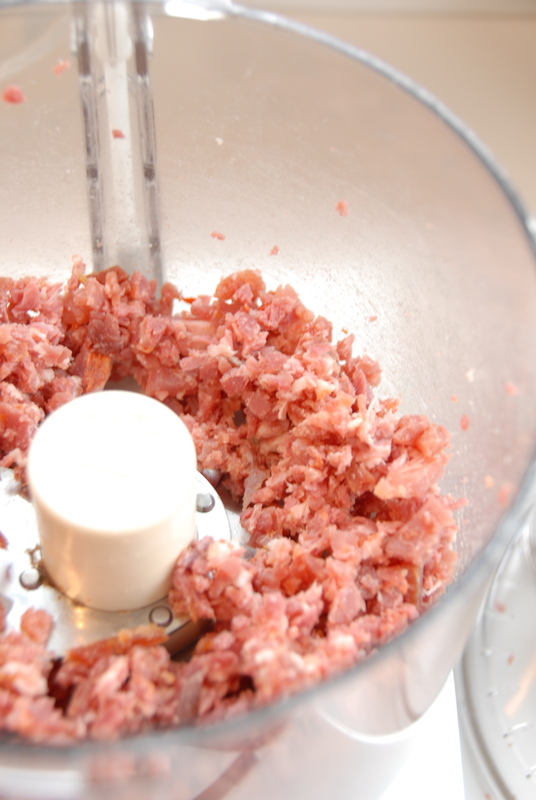 Next, in a food processor combine the capicola and prosciutto. Pulse until the meat is coarsely ground. 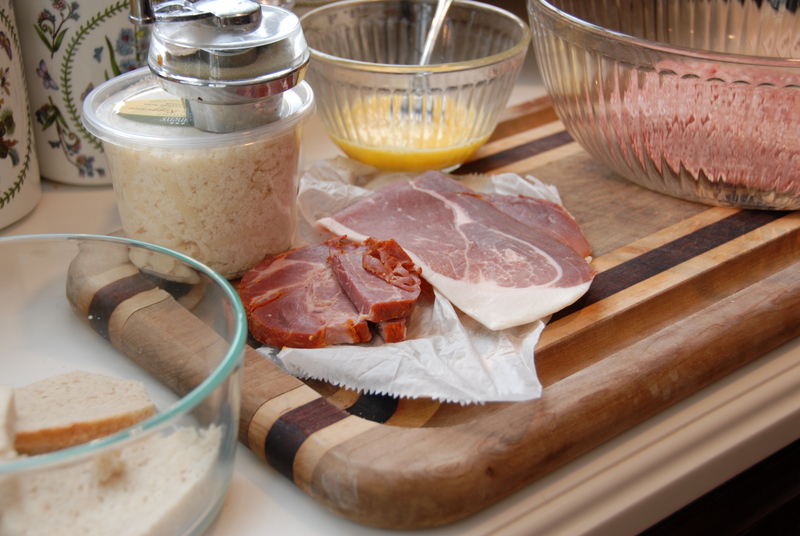 In a large bowl combine the prosciutto and capicola with the ground pork, bread, 2 beaten eggs, parmesan, nutmeg, salt and pepper. Be sure to season well with the salt and pepper. Mix by hand until all the ingredients are just combined – you don’t want to overwork the meat. Let the meat mixture rest in the fridge for about an hour before forming into balls. While the meat rested I whipped up a tomato sauce. 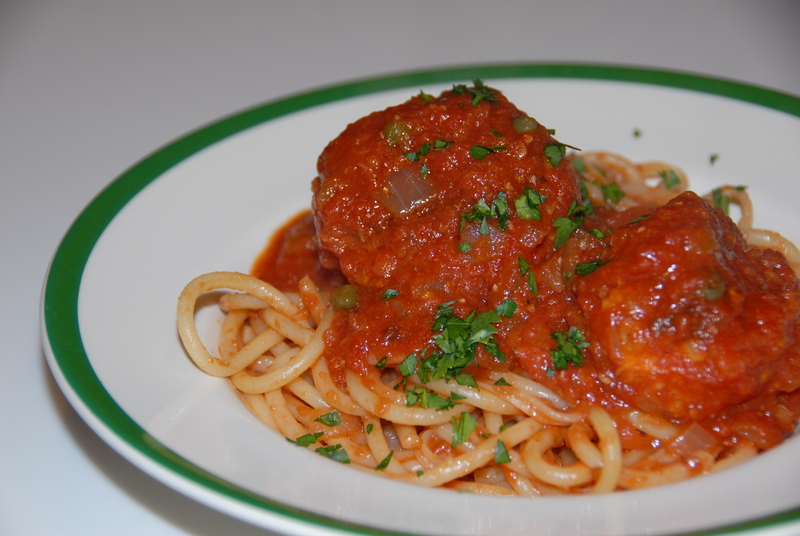 Since the meatballs were going to have a little kick from the hot capicola I thought a spicy all’amatriciana sauce would work well and hey, it allowed me to use even more pork – brilliant! I cooked the bacon down until it was golden brown, removed it and used the fat (along with a touch of olive oil) to cook the onions. The onions cooked for about 5 minutes then I added the red pepper flakes and garlic. After about another minute of cooking I added the tomatoes and seasoned the sauce with salt and pepper. I didn’t put the cooked bacon back in the sauce (my sister was coming to dinner and she can’t stand bacon – I know, I know, I don’t understand either) but you absolutely could. I let the sauce simmer for about 10 minutes and then tasted it for seasoning. Then I added the capers, a good pour of vermouth and a tab of butter (I picked up this tip awhile back that by adding a bit of butter to a tomato sauce it makes it a bit more velvety and even more delicious!) and let it simmer away on low. Now, back to the meatballs. 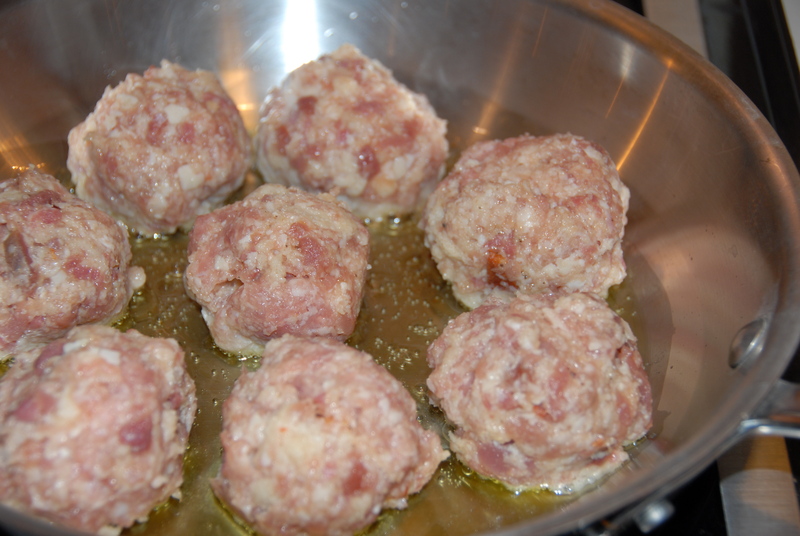 I formed the meat into 16 balls that were a little larger than golf ball sized. Over medium-high heat I placed 2 tablespoons of olive oil in a large skillet. I cooked the balls, turning occasionally, until they were browned on all sides (beware splattering and shooting hot oil) – about 10 minutes. After browning/cooking them in the skillet I placed them in the tomato sauce where they continued to cook for another 20 minutes or so. With meatballs cooked and hanging out in the sauce I boiled water and cooked a lb. of bucatini – my favorite pasta and the perfect complement to the delicious sauce and meaty meatballs. With each bite you get a little heat, a little spice, a pop of saltiness from the capers and the parmesan and great texture from the 3 types of meat. Honestly, who needs beef when you can have pork upon pork in one delicious meatball package? I’d say the only thing missing from the amazing meal was my partner in crime – Hillary, I was wishing we still only lived a few blocks away so you could have joined us for heaping plates of pasta and triple pork meatballs, chianti and a snowy winters night. This entry was posted in Pork and tagged all'amatriciana, bacon, bucatini, capicola, Chef Michael White, meatball, Osteria Morini, pork, prosciutto, San Marzano tomatoes, Tasting Table. Bookmark the permalink.